Soluciones de iluminación de alta potencia con focos moviles. El Quad Pod es una solución móvil al aire libre de iluminación con focos de alta Potencia diseñado específicamente para la Construcción, el Alquiler de Material, Vía Ferroviaria, Servicios Públicos y Eventos al aire libre. Why is the Quad Pod portable lighting tower so popular? Please enter your email address below and we will instantly send you a copy of the brochure. New 200W Ultra Efficient High Power 24,000 lumen LED Head. Total for 6 head Quad pod up to 144,000 lumens. The Quad pod is now fitted with the Latest Generation of High performance LED light source with new technology from Philips LED. These improved LEDs make the Quad Pod light source ultra bright, ultra efficient, rugged and reliable. Each 200W head offers an impressive 24,000 lumens of 6000K LED light. 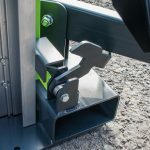 Fully enclosed fork lift pockets combined with additional tie down points allow maximum load out and simple handling at depots and destination. Slack rope protection system to prevent the winch from being operated in an unsafe condition. Mast Safety interlock system to prevent the mast from being raised until the last stabiliser leg has been deployed. New Faster deployment in less than 2 minutes due to improved leg retaining catches and high grip tension bars. The new rubber strap and catch system allows rapid release and securing of the Quad Pod legs. The addition of a Friction grip on the Leg tie bars allows quick tension of legs even if ice or mud is present. Allow maximum load out and simple handling at depots and destination. Extension leads are available in a variety of lengths to meet customer requirements.